Kevin.Murphy Shimmer.Shine & Shimmer.Me Product Review: To Brighten & Refresh! 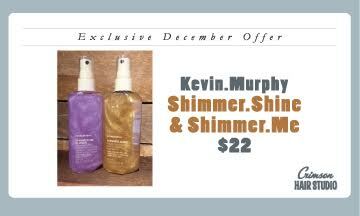 Kevin Murphy has designed two products to brighten & refresh your hair: Shimmer.Shine & Shimmer.Me. The shiny beauty of both products are stunning; the benefits of the beauty of the product are truly on display! Shimmer.Shine is gold in color & perfect for everyone to use as a fancy scented protecting or finishing spray that nourishes, protects, & adds brilliance hair. It’s not heavy & leaves no residue. Shimmer.Me is specially formulated for blondes; the purple tint optically brightens the hair color by counteracting yellow tones! Benefits: Shine on, you crazy diamond! Twirl product to allow the shimmer to disperse. Apply to damp or dry hair, & either before or after styling to protect, refresh, & shine! 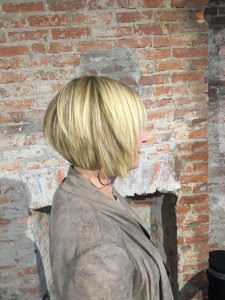 Our fabulous client Anne’s Review: I love how Shimmer. Shine gives my hair a soft healthy glow while bringing out the contrast of my high & low lights. Sometimes I use like to use quite a bit; it tames my fullness & creates a piecier, sculpted look.